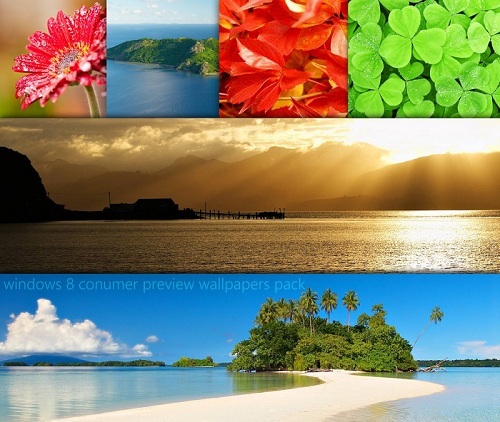 Windows 8 Consumer Preview Wallpaper Pack is compiled and distributed by silviu-eduard. License : Not Mentioned. We have linked the download to deviantArt’s Server. As said by Silvia Eduard, “Microsoft is soon expected to unveil the Consumer Preview build of Windows 8 publicly this month, various leaked image of Windows 8 Consumer Preview build 8220 are already floating all around the internet, One of the theme packs of Windows 8 Beta has now been posted publicly for download consisting a total of 7 desktop backgrounds, including two wallpapers for dual monitors”. Please note that, this statement was written before Windows 8 Consumer Preview was available. It is a RAR download, the file is 23.9 KB in size. Cite this article as: Abhishek Ghosh, "Windows 8 Consumer Preview Wallpaper Pack," in The Customize Windows, March 27, 2012, April 18, 2019, https://thecustomizewindows.com/2012/03/windows-8-consumer-preview-wallpaper-pack/.